These notes are in part based on a course for advanced students in the applications of stochastic processes held in 1978 at the University of Konstanz. These notes contain the results of re- cent studies on the stochastic description of ion transport through biological membranes. In particular, they serve as an introduction to an unified theory of fluctuations in complex biological transport systems. 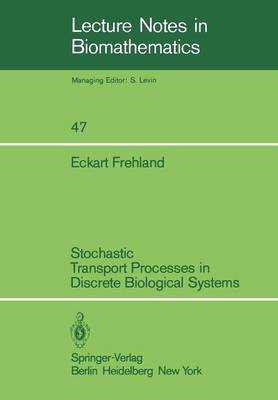 We emphasize that the subject of this volume is not to introduce the mathematics of stochastic processes but to present a field of theoretical biophysics in which stochastic methods are important. In the last years the study of membrane noise has become an important method in biophysics. Valuable information on the ion transport mechanisms in membranes can be obtained from noise analysis. A number of different processes such as the opening and closing of ion channels have been shown to be sources of the measured current or voltage fluctuations. Bio- logical 'transport systems can be complex. For example, the transport process can be coupled to other processes such as chemical reactions and take place in discontinuous structures of molecular dimensions. Furthermore, since there are strong electric fields or high concentration gradients across biological membranes ion transport processes of biological relevance are mostly processes far from equilibrium. For these reasons the development of new theoretical concepts has been necessary. The concept of transport in discrete systems has turned out to be more appropriate than continuum models.